A day mostly off road and quite difficult and narrow in places and again very hot at 33 degrees. 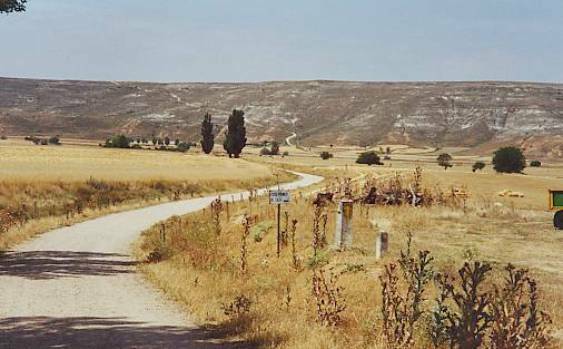 The route went through Los Arcos and Torres del Rio and then Viana, where I stopped for a while to escape the heat as were about 50 other pilgrims, half with bikes. One of the bike pilgrims that I chatted to was 78 and the others in his group were not much younger. Being Spanish they all had expensive bikes and kit and were dressed in the full Lycra gear. There seems to be something in the Spanish biking mentality that says one must overtake a non Spanish cyclist whilst standing up in the pedals and however steep and long the hill pushing ones bike is not allowed. I presume I have no Spanish blood. After Viana the route descends to Logrono the capital of the Rioja wine region and rather a nasty, large and modern place from the little I saw of it. I attempted to find the apparently interesting old part of Logrono without any success so set off again. Getting out of Logrono on a bike was difficult as it involved riding on a busy dual carriageway with underpasses and the like until the off road path was picked up again on the edge of the city. 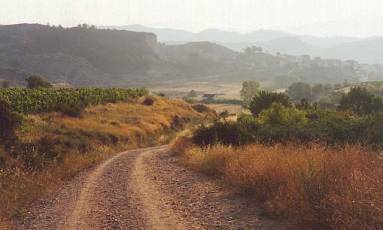 The route passed through areas of lakes and picnic spots before climbing to the small village of Navarrete before joining the main N120 road to Najera. The refugio at Najera was already full when I arrived at about 6 o’clock. 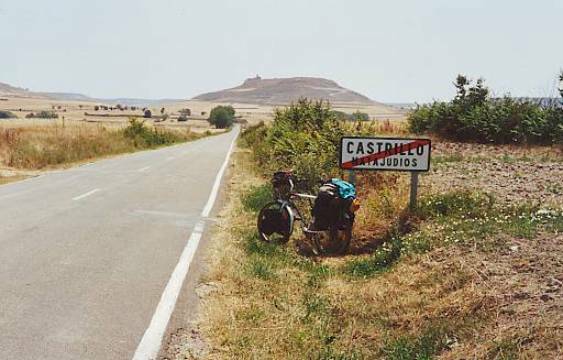 They said I could sleep on the floor but I had made my mind up to stay at camp sites from then on if possible and ,after all, I had cycled 56 miles in blistering heat just to get to Najera and one of the few camp sites on the route. I had my pilgrims passport stamped at the refugio and set off to look for the camp site, which was just down the river under the red sandstone cliffs that are a feature of the town with their pre historic caves. I had a quick shower and then back into town to look around. There was a fiesta just starting. Most Spanish towns seem to have a fiesta of some sort most days, any excuse for a party and to stay up all night. This one involved a stage, loud music in the main square and a play about the history of the town set to music again. The main square was right outside the refugio, yet another reason not to stay there. Back at the camp site Franz and his wife Lena were in the next tent. They had cycled from Amsterdam on their strange lie flat bikes and were intending to follow the route to Santiago and then ride back to Amsterdam, quite a trip! 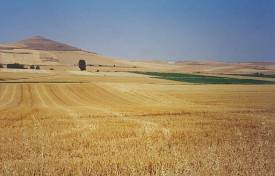 Once outside Burgos the route departed from the main road and passed through open countryside, almost entirely wheat fields as far as the eye can see again. It was fairly hilly in places but the path had a surface OK for riding on. It was mostly only about 3 feet wide though so the worst obstacle was coming up behind pilgrims on foot. Not having a bell I had to resort to “excuse me”, “permiso”, “ahem”, etc. Next time I will take a bell though as quite often they don’t seem to hear my noises. Walking pilgrims are a nuisance to us cyclists, always walking in the middle of the path, darting from side to side as one approaches, huh, I swear some of them actually want to be run over, some sort of penance perhaps. Because of this and the fact that it was a very hot day I took what I thought (wrongly!) was a short cut (probably just short of Hornillos del Camino) and opted to follow the tarmac. This may have been a mistake as the road took me North to the N120 again. Although not really part of the Camino it was pleasant area, especially on a bike. I stopped for a while at the pretty little village of Olmillos de Sasamon and soon afterwards followed the road from Villasandino to Castrojerez. It was a small road with very little traffic and ran almost dead straight down a long valley, perfect for cycling with truncated willow trees at even spaces for miles. 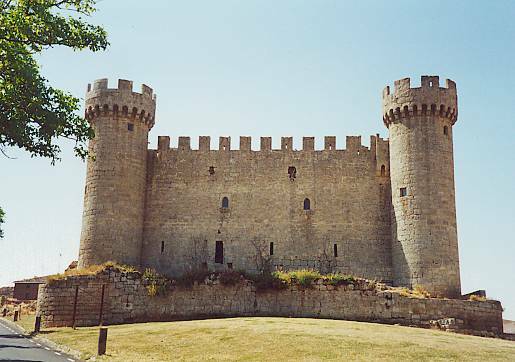 There was a camp site where I intended to stay at Castojerez but the town seemed very sleepy with little to do so I opted to ride on to the next one at Carrion de la Los Condes. From Castrojerez the off road route could be seen climbing over a steep hill in the distance so I took the tarmac option again to avoid it. It was the hottest day so far at 35ºC and the next camp site was quite a distance away yet (well that is my excuse anyway!). Next time maybe. 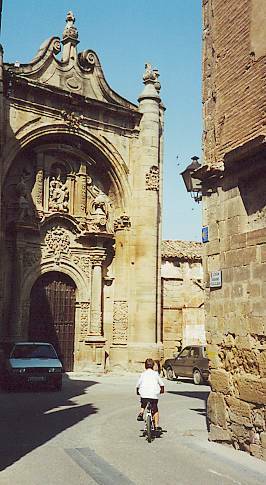 The road took me past small villages such as Castrillo Matajudios, Fromista and Villalcazar de Sirga with its strange church. The whole area gives the impression of being deserted. All along the pilgrim route water taps are provided every few miles and in this area that is very useful as I was unable to buy my normal bottled water due to the lack of shops and bars in the few villages. Arriving at Carrion de los Condes I stopped first at the refugio to get my passport stamped. I had been told back in the first refugio at Cizur Menur that they should only be stamped once a day at the place you stayed overnight but it seemed most pilgrims had their passports stamped at every refugio they could find along the way. From now on it seemed a good idea, I thought, as at least it would be a good record of the route I had taken. The refugio or albergue as they are sometimes called, at Carrion de los Condes is run by nuns and is a fine old building set around a courtyard. It seemed very clean and peaceful and I was tempted to break my rule of only staying at camp sites as, at 66 miles and 35ºC, this had been the hardest day’s ride so far but as the camp site was close by I ended up there, meeting up with the Dutch couple on the strange bikes again. I had a meal in town that evening and chatted to a French couple who were riding the camino on bikes. They were travelling light and staying at hostals and small hotels. Back at the camp site I stopped at their cafe for a couple of beers and then as it looked rather appetizing a cazuela del pescado. It was good, cheap and not deep fried but two meals in the one evening is not going to help my waistline. Perhaps it is beyond help. 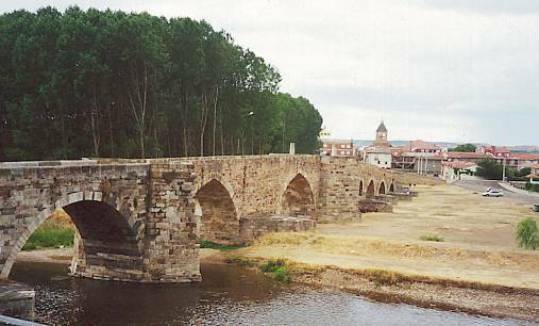 I passed through Bercianos del Real Camino, El Burgo Ranero, Villamarco and Reliegos before arriving at Mansilla de las Mulas. The whole area was very desolate and empty just a narrow path with evenly spaced plane (I think) trees stretching to the horizon and then to the next horizon. There were no tarmac roads for miles around. It can have changed little in hundreds of years. (wrong! 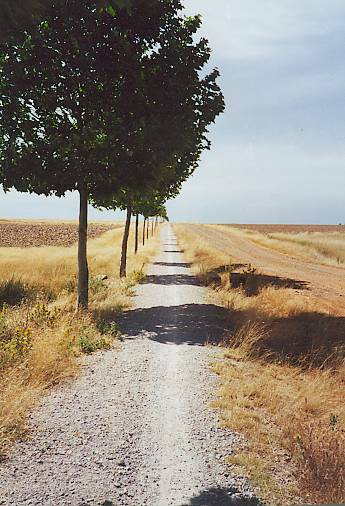 - I was later told this path is a fairly recent addition to the Camino). There were few other pilgrims to be seen and I suspected most caught a bus around this obstacle but on a bike in this sort of weather I found it one of the best days of the trip. Mansilla de las Mulas is a small, again somewhat run down, town on the banks of the river Esla. There were quite a few very old buildings and the remains in places of the medieval town walls. 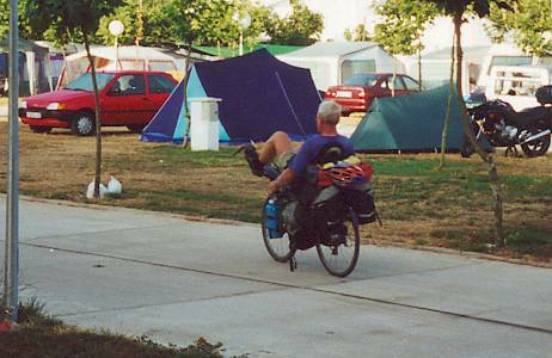 The camp site was on the opposite bank of the river and again I met up with the Dutch couple on their odd bikes. That evening I had a meal of sopa cocido (soup with little balls in weak tomato water) followed by merluza (hake, deep fried) with a few chips and a small salad (the usual again I am sorry to say), followed by natillas (another name for the usual flan but this time with a small biscuit) with a bottle of wine, coffee and bread, all for1000 pts. Not bad really, and the waitress was not bad either for a change. Spent some time chatting the waitress up (without much success) and drank too much in the process as usual. I started late due to a lie in (Well OK a hangover) and rode the 20 miles or so to Leon, half on the track and half on the N601 road, as the track was mainly alongside the road anyway. Basically you feel safer on the track but it is faster on the tarmac. As it was a Sunday, Leon was not crowded and I stayed for 4 hours or so looking around. The centre with the famous cathedral is interesting but the suburbs are like any modern large city and best avoided. Leon marks the end of the flat plateau and the beginning of the mountains and as I climbed out of the city at La Virgen del Camino the weather broke in spectacular style with a fierce storm and serious thunder and lightning. I dived for cover in a handy bar along with a couple of other Spanish bike pilgrims and stayed there sheltering for a couple of hours. It did cross my mind that the lightning might be to weed out the real pilgrims from the bogus ones and I was not sure of my status on that one. 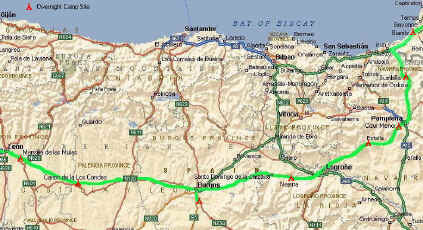 The route was again alongside the main N120 road to the next camp site at Hospital de Orbigo. As I approached the town a storm could be seen approaching from the other side. It was a race so I pedalled as fast as possible to try and get there before the storm which looked very black and sinister with lightning and there was very little shelter nearby. I was a few hundred yards from the town when the storm hit with very strong headwinds at first which made cycling fast impossible but I just made it before the rain and dived into a bar for another beer or two whilst it raged outside. Once it had passed I crossed the medieval bridge into town (most of which no longer crosses the river) and sought out the camp site. Yes, the Dutch couple on the funny bikes were already there. Most of the streets in Hospital de Orbigo are laid with large cobble stones which makes riding a bike rather slow. The town itself is quite small, about Helston sized, set in a more or less flat valley and dominated by its bridge which like most of the medieval bridges on the route is pedestrian and bike only. There were only a few restaurants in town, most pretty ordinary. One however had a partly covered courtyard set around a pond that was teeming with small fish, around which half a dozen people were fishing, presumably for their supper. The Dutch couple told me that tomorrow will be hard work as the next camp site is at Ponferrada which is about 60 miles away and the route is very hilly.